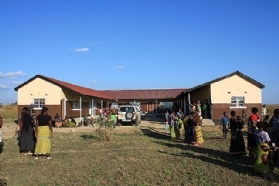 Established in 2011, MC-Zambia’s community center is based in the center of Chanyanya (pop: 11,018), a fishing village nestled on a lagoon off the Kafue River, approximately 22 miles from the town of Kafue. Today, the center offers accredited programs in Information and Communications Technology (ICT) and Design, Cutting, and Tailoring, alongside a literacy program and youth-focused social programs. The local MC-Zambia Leadership Team (Board of Directors and Country Manager) oversees the center and its programs. MC-Zambia is registered as a non-profit under the Societies Act CAP 119 of the laws of Zambia. Read the FAQ.